The West Oakland Truck Management Plan, a joint City/Port plan to address truck circulation and parking in West Oakland, got underway in October 2017. Please check the Truck Management Plan website for information about this City/Port effort and to subscribe for updates about the West Oakland Truck Management Plan. Location: West Oakland, the former Oakland Army Base served as a U.S. Army facility until it closed in 1999. In 2000, the Oakland City Council designated the Base and surrounding properties as a Redevelopment Project Area. The 1,800-acre Army Base Project Area was divided into three major sub-districts: 16th and Wood, Maritime, and Oakland Army Base (OARB). 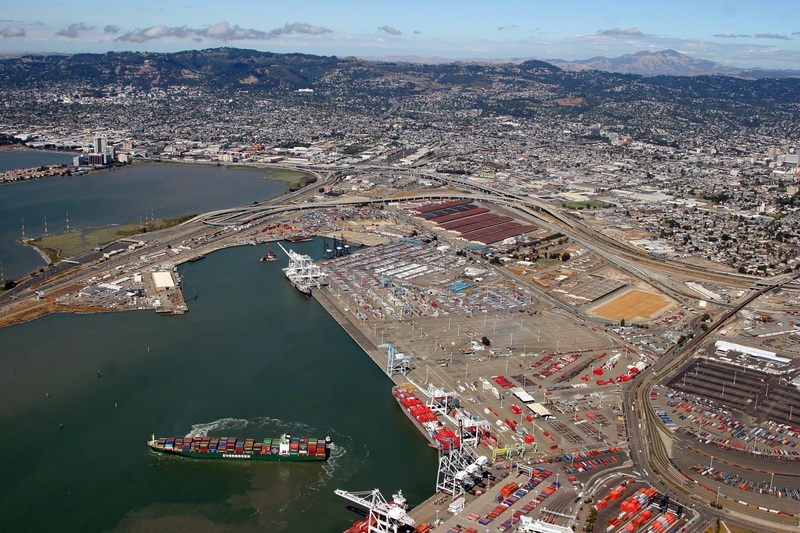 The OARB was further divided into two areas: the Gateway Development Area owned by the Oakland Redevelopment Agency and the Port Development Area owned by the Port of Oakland. 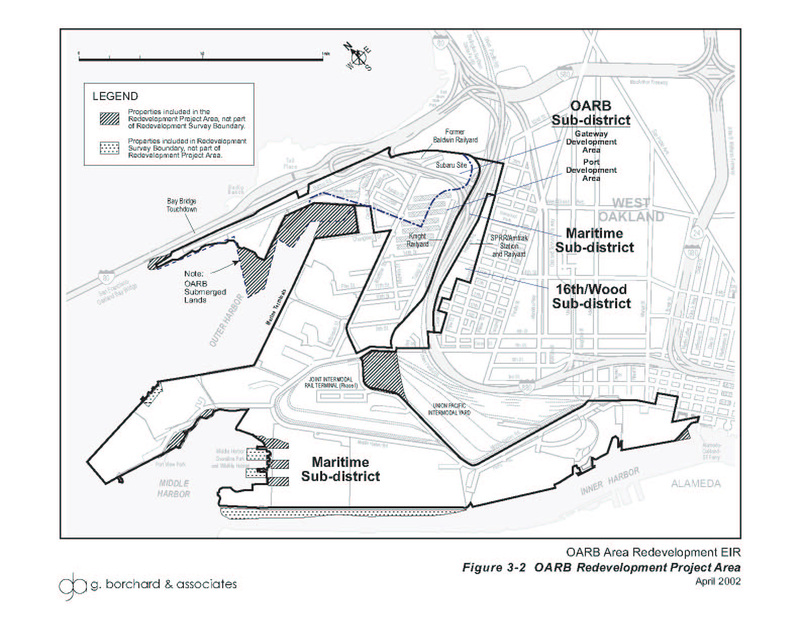 Following the dissolution of the Redevelopment Agency in 2012 as a consequence of ABx1 26, the Gateway Development Area was transferred to the City by deed, and the City assumed all of the environmental obligations attached to the entire former OARB sub-district, and all of the redevelopment obligations for the Gateway Development Area. Approximate OARB Land Area: 310 acres (City 159 acres / Port 151 acres), excluding submerged lands and existing roadways. With funding commitments from the City of Oakland and major grant funding from the Federal Government, Transportation Commissions of the State of California and Alameda County, the City and Port of Oakland are leveraging significant private investment by transforming approximately 300 acres of the former Oakland Army Base into a modern logistics center master planned to shift traffic from trucks to trains on site and thereby reduce truck trips through cities within Alameda County to the Central Valley which will help to improve air quality, neighborhood and roadway safety along with the creation of a significant number of direct and indirect job. In 2016, The Alameda Transportation Commission approved a $41 million dollar grant for the construction of Public Roadway Improvements at the former Oakland Army Base. In November 2016, Prologis, the global leader in industrial real estate development and logistics started construction on the first of three state of the art logistics facilities to be developed at the former Oakland Army Base. 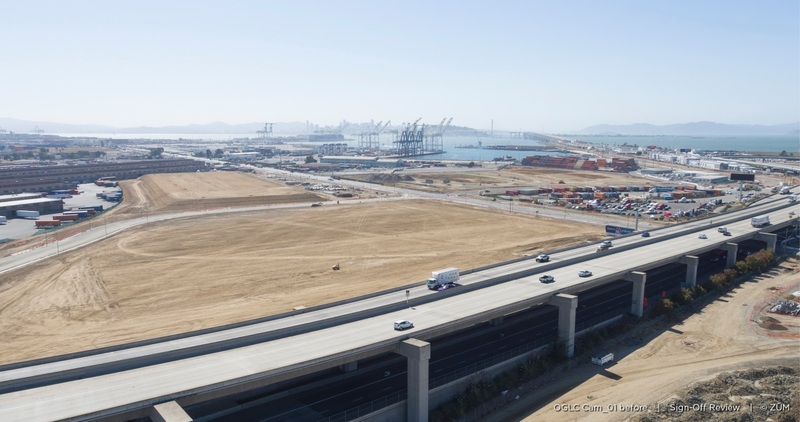 The first out-of-the-ground development totaling 25,000-square foot facility is part of the nearly one million square foot master planned, 160-acre Oakland Global Trade and Logistics Center. 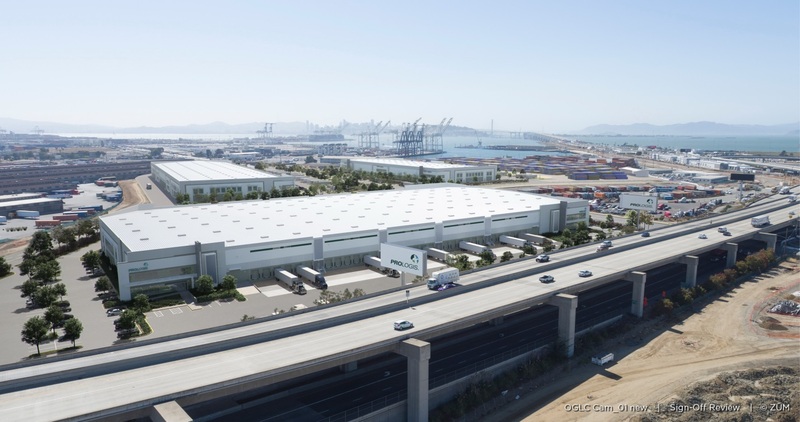 The first phrase of Prologis development is expected to be completed by mid-2017. Phases two and three will add another 410,000 square feet of new Class A industrial space. Meanwhile, the Port of Oakland is opening a 370,000 square foot refrigerated "Cool Port" warehouse and distribution facility. The new logistics cluster is anticipated to create thousands of new jobs while reducing truck traffic and pollution. West Oakland Community Advisory Group (WOCAG) was formed in 1996 as the citizen advisory body for development of the former Oakland Army Base, as part of the federal community base reuse planning process. 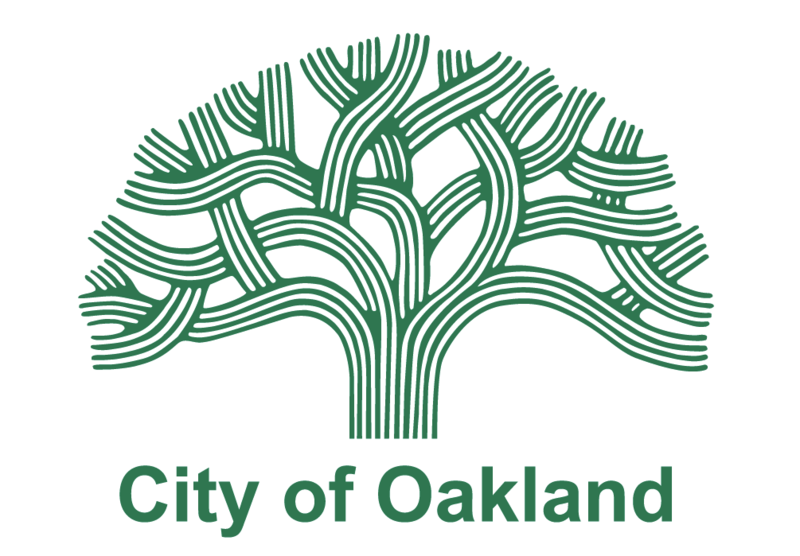 Membership is drawn from West Oakland residents, businesses and community organizations, and is set at 16 members. WOCAG is staffed by the City of Oakland and the Port of Oakland. The public is welcome to attend the group's meetings. Community Jobs Agreement Working Group (CJAWG) is a community advisory group that will develop an overarching Community Jobs Agreement for the Army Base project, which will encompass construction and operations jobs. The Project Labor Agreement with the City for the construction phase of the Army Base project will be based upon the goals and policies of the Community Jobs Agreement. The CJAWG is recommending consideration for local hire, a jobs center, apprenticeships and disadvantaged workers. Membership in the CJAWG is drawn from community coalitions and other Army Base project stakeholders. For additional CJAWG information, please contact John Monetta at jmonetta@oaklandnet.com or (510) 238-7125.